Imagine a friendship between a man and a bird. A friendship demonstrating the value of belief, faith and perseverance. 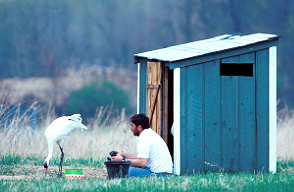 A unique friendship that helped keep the Whooping Cranes alive on earth. George & Tex: The Remarkable Friendship To Save The Whooping Cranes is a vibrantly illustrated picture book that touches the mind and heart. Both children and the young at heart will treasure this story. It demonstrates how each of us can make an important difference on earth. The key is to believe in our dream. Persevere — no matter how long it takes. And then take action. Written by Lynn Sanders and illustrated by Sergio Drumond, George & Tex raises awareness about the need to care for our endangered cranes, and how one person made a difference in helping save the Whooping Cranes.